NOTE: The review of Etiquette is written by Matthew Ivan Bennett, a Utah playwright whose work has been premiered by Plan-B Theatre. 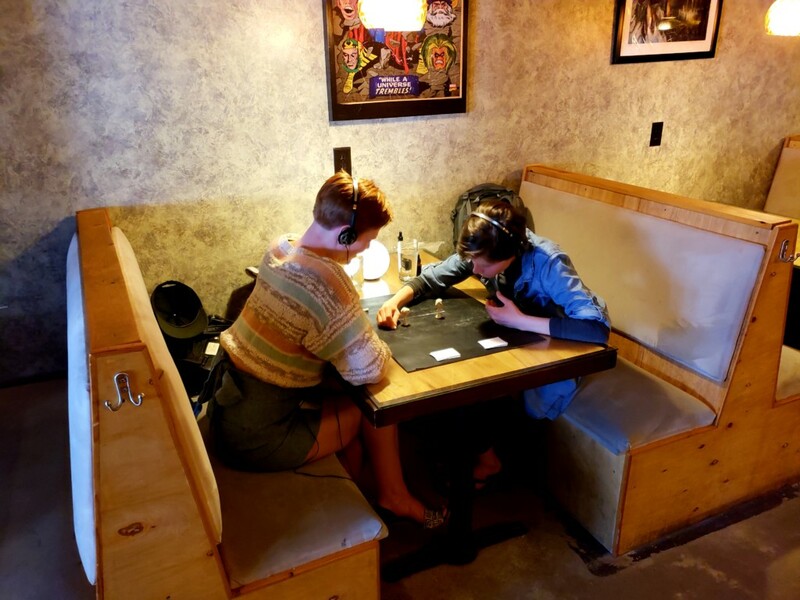 Bennett’s next premiere is Radio Hour Episode 12: Stand, which will be presented by Plan-B Theatre and KUER-FM’s RadioWest program live on April 26 at 9 a.m.
Etiquette may sound like the title of a moth-eaten, three-act, drawing room comedy, but titles can be deceiving. 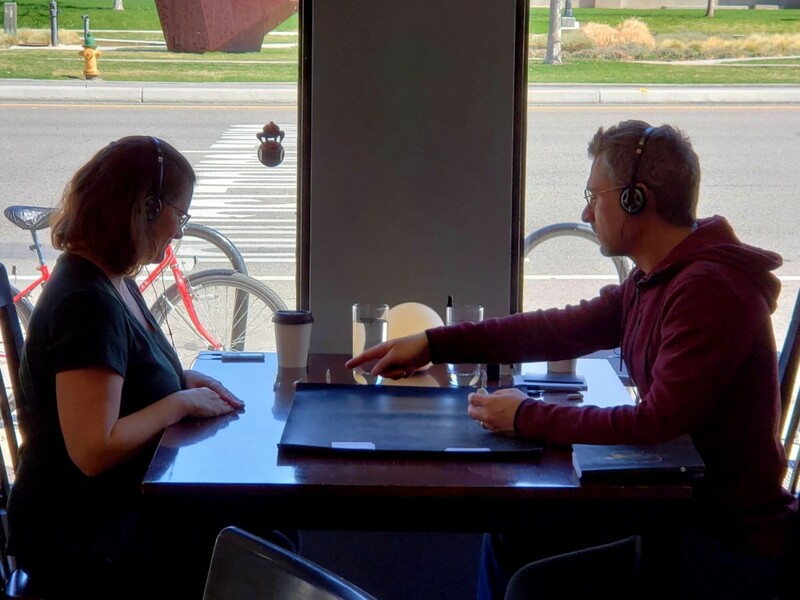 The production of Etiquette I saw—or, rather, participated in—took place at the Watchtower Café on State Street in broad daylight. Without actors. With no audience. But not without a script. Etiquette is not traditional fare. When my plus-one and I arrived at the Watchtower, there was no hint that a play was about to begin. Grunts and pows came from the old arcade version of X-Men vs. Street Fighter in the corner. An Easter Sunday breeze blew through the place and people with 16-ounce coffees and biscotti clacked away at their laptops under a poster of Alex Ross’ Superman. But before long I was sitting at a table in the window with headphones. On the table in front me lay Blue-Tac, a water glass with a dropper resting on its rim, a black notebook, a Sharpie, and other oddities. 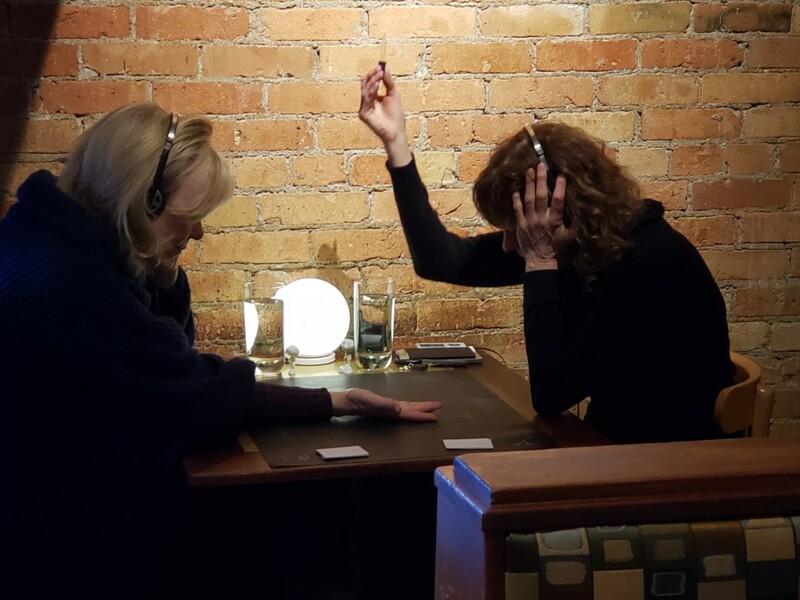 I knew nothing about the play except that I would be putting on headphones and pretending to be someone else for a half hour. The time whooshed by. The power of Etiquette — conceived in 2007 by Ant Hampton and Silvia Mercuriali at Rotozaza in London — is how the piece traps your attention, again and again, in strange and fully present moments. The play is making its Salt Lake City premiere, a rare stop in the U.S. It was last seen in Buenos Aires and played previously in Pamplona, Spain; London; Cologne, Germany; Graz, Austria; Copenhagen; Hong Kong; Amsterdam; Itami, Japan and Czech Republic. It is available in 17 languages. I came away feeling that allowing myself to be present, through the convoluted yet up-close-and-personal daydreamy trek that is Etiquette, was the whole point. Broadly speaking, we expect theater to be the communication of some important idea through narrative. Or failing that we expect diversionary fun in the form of plot and characters. 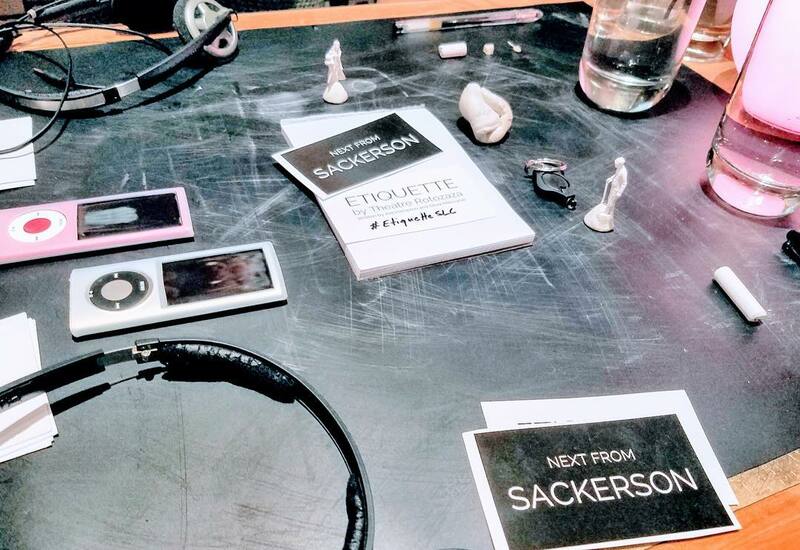 Sackerson’s latest production seems not to operate on those values or expectations. Rather, it operates in the “negative space” of pure imagination and feeling, with a few hints coming from the “positive space” of characters and setting. Mechanically, the show is one part listening, one part reading aloud, and one part playing with props. But in essence the show is a rare and safe opportunity to play make-believe in a public space and feel an instant if-curated intimacy with another person. I experienced the show with my wife, but the script and headphones made her excitingly unfamiliar. If nothing else, Etiquette rises to the level of art for nothing more than the fact that it makes simply staring at another person a thrill. One person pretends to be an old man and the other pretends to be a younger woman who declares herself a prostitute. What unfolds, however, is far from what you might predict based on those given circumstances. The production guides you, imaginatively, from a café to backstage at a theater, to a shack on a hill. But again, the story hardly matters. Where Etiquette excels is in its imaginative-sensory moments that the sound design, the instructions, and you create together. Since the show’s inception, it has appeared in dozens of cities and 17 plus languages. If you want to hear the instructions in Spanish—or Welsh for that matter—Sackerson can accommodate you. Probably, it has crossed cultures so easily because of the avatar-like quality of the characters. You need not be a woman to experience the woman’s track or a man to experience the man’s. This is definitely not the first time Sackerson has gone rocketing out to the Kuiper belt of theatricality. Their 2017–2018 programming at the Art Factory sported a Grand Guignol musical revue, a lightning-speed and irreverent one-man Hamlet, and then a tender, cello-scored version of Antoine de Saint-Exupéry’s The Little Prince, the latter of which had silhouettes, stylized movement sections, and what dramatist Erik Ehn affectionately calls Big Cheap Theatricality. With their production of Etiquette, Sackerson producers Dave Mortensen, Alex Ungerman, and Morag Shepherd have, once again, redefined theater for Salt Lake. From their choreographed re-creation of The Bride of Frankenstein a few years ago, to their next project (also a play with headphones, called Hindsight by Morag Shepherd), they’ve demonstrated far more than a taste for the unconventional; what they have is a taste for the simple and fun and human inside the unconventional. Etiquette runs through April 15 at the Watchtower Café and Desert Edge Brewery. Because the “show” is just two people, with audience and actors being one and the same, tickets are limited. You can buy them online through the Sackerson website.